I finished Arkham Origins last night… well, it was verging on early morning. Overall impression: AO is like someone was told to closely study and imitate the greatest game of all time, Arkham City, and they did. It’s very much like AC, it nails the art style, it even extends it in some ways, it’s fun being Batman again… but it has little flavor of its own. I have a bunch of complaints, which I’ll present in handy bullet point form. The voice actor for Joker tries to match Mark Hamill without really getting there. This is not what you should do with an iconic performance– you should find your own way instead. He even sings a song over the credits… not well. It doesn’t help that the writing never hits the heights of AC either: Joker is not very funny. There are some very annoying boss fights– particularly Deathstroke and Bane. I guess I dislike the mode of “ordinary damage does no good; you must only use these particular maneuvers”. At least there’s no annoying cooldown. Man, I hated one puzzle where you have to use the glue gun very quickly. If you aim and fire, you just do not have enough time. Finally I realized– this game was optimized for consoles, it doesn’t require aiming– use the 5-5 quick combo. And that worked. Mad Hatter returns… he gave an annoying fight in AC, and here he has his own dream sequence, which highlights one of the persistent problems of AO: it’s linear to the point of bugginess. E.g., there’s a place where you have to run to a wall, in a spot you can’t stay on long because it’s periodically electrified, and use your explosive gel. Except 3/4 of the time, you hit the gel key and he gels the floor. Finding the sweet spot where the Batdoofus will actually gel the wall is frustrating and makes you wonder if they actually had QA. They also return, ill-advisedly, to the 2.5-d sequences of Arkham Asylum, and there’s points where the controls go wonky and the game takes your attempt to jump a gap as a command to plummet to your death. General rule of thumb, designers: don’t kill me for a mistake which the character would never make. Rocksteady realized this, turning accidental leaps into graceful recoveries with the batclaw. Similarly, there are a lot of places where your abilities should work, but don’t– e.g. walls that you can’t grapple up. 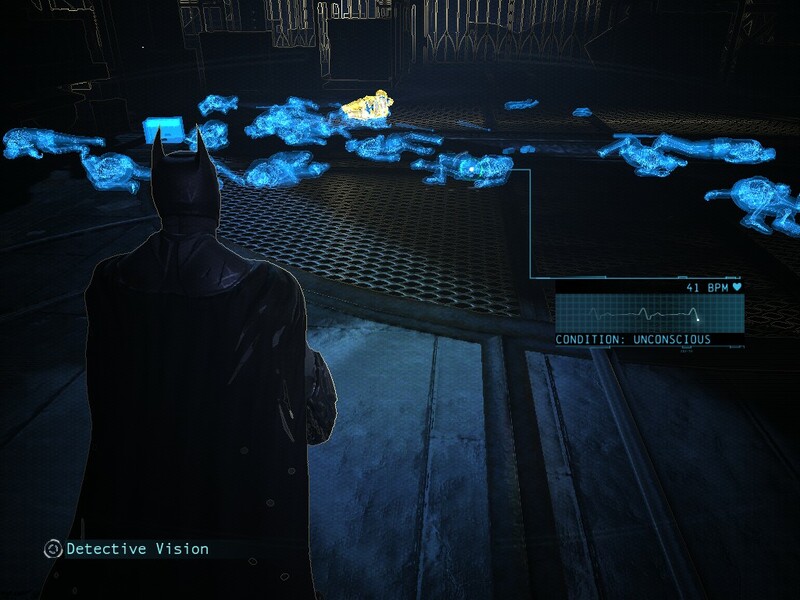 I know Batman’s abilities make level design hard, but it can be done– see AC. I realized only very late that you only get the Sonic Batarang for a very specific challenge– complete a predator scene without being seen. And I’d already gone through most of them. There is, by the way, often no feedback on whether you’ve been seen, so you can’t replay the encounter if you finished it and got spotted invisibly. The overall setup promises an intimate glimpse at eight villains, but few of them have as much character as AC’s Penguin, Poison Ivy, Mr. Freeze, and Two-Face. They’re almost all just dudes who show up for a boss fight and have no agenda of their own. I dunno, whaling on cops is just a smidge disturbing. Batman is supposed to be noir, and while noir may feature corrupt cops and an edgy hero/cop relationship, they’re usually not fair game for beating up. No Catwoman. (Though there’s a cute reference in the GCPD.) It’s a pity, because AC really benefitted from having an additional playable character, and such a fun one. Hard to get used to, but defensible: combat is much harder than AC. The biggest change is subtle: the mooks hit you a tad earlier, which is just enough to screw up my AC-honed skillz. If you wait till the “gonna attack” symbol is big, it’s too late. You have to hit faster, or evade. In the same category, it’s weird that there are some places that are too tall to grapple up to. It makes sense that the line isn’t infinite, but it’s an unexpected change from AC. After a punishing fight with Bane, he turns into a Titan. I was expecting an even more grueling fight… but it turns out to be a predator encounter. Awesome: the last boss fight requires stealth rather than power or gadgetry. The single best design decision of the game. Oracle does return. The whole Gordon arc is pretty good. He’s maybe maybe too stubborn, but after all it’s just one long night in Gotham, he’s not going to change quickly. Similarly, we see more of Alfred. Though the dude is right: even Batman has to eat. If Batman has time to respond to random crimes in progress, he has time to grab a turkey leg and a beer. If you let him, Anarky will jaw at you forever. Although I can’t approve of the terrorism thing, he actually makes some good points about Batman’s weird insistence on going it alone, and his complicity in keeping a corrupt system pretty much the same. The shock gloves feel slightly cheesy, but hey, they’re fun. As the combat is harder, it’s great to have something to equalize it. The crime scene re-enactments are one of WB Montreal’s few extensions to the Rocksteady basics. It’s a nice mechanic and I’d like to have seen more of it. The Quincy Sharp appearance at the end is cute.